Thanksgiving Day is celebrated in Canada and United States. Canadians celebrate Thanksgiving day on the second Monday in October while Americans celebrate it on the fourth Thursday in November. In American History, Thanksgiving Day is the day that the Pilgrims met the helpful Native Americans (Indians) and give them food and showed them the different farming techniques. Let's teach your children about the Native Americans on this special day by making Native American themed crafts with them. Example of crafts include an Indian Doll, Indian Rattle, Indian Bowls, Indian Costumes, Canoes, Tepees, Indian Headdress, Totem Poles, and Dream Catchers. Take a sheet of any kind of plain paper about 81/2 by 11 inches and draw a semicircle the long way of your sheet, as shown in the picture above. Cut this out. While it is fiat, draw or color some Indian designs all over the surface. Then fasten the straight edges together with staples or paste. Make several of these—enough to build an Indian village for playing with tiny cowboy and Indian figures. Or use one as a table centerpiece for an Indian party. This is an easy craft to make...and you can take it further than we did by decorating it differently. All you have to do is wrap construction or decorative paper around a coffee can and attach with glue or paste. Now add indian designs all around the can and cut cloth or paper fringes to wrap around the top. Then just cut a hole in the plastic top and you are set for using it as a money bank. This is a really cool craft to make to celebrate the Native American Indian. 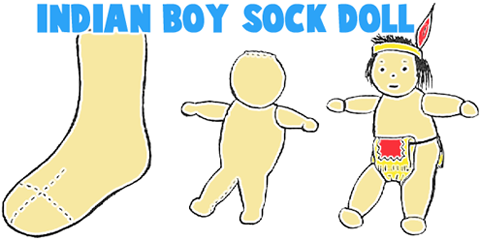 Gather the following items.... a child's tan sock, needle, thread, black embroidery thread, scissors, cotton or filler, 1 strip of colored cloth 7 1/2" x 1 1/2", piece of ribbon to fit around head, rubber band, 1 small craft feather, crayons, and a ruler. Cut sock 2 1/2" from toe. Cut toe section in half to make arms. Fold sock foot flat and cut to within 2" of heel to make legs. Turn wrong side out and sew around legs. Turn arm pieces and sew, leaving wide ends open. Turn body and arms and stuff with cotton. Gather top of sock and sew. Tie several strands of black thread around legs and arms 1/2" from ends (for feet and hands), and 21/2" from top of sock for head. Sew on arms. Draw face with black crayon. Loop embroidery thread, cut and tie, then sew to top of head. Tack ribbon around head and insert feather. Fringe and color a strip of colored cloth and. slip under rubber band at waist for loin cloth. If you enjoy playing Cowboys and Indians, then you will want to make this rattle. You will need an empty salt box. Put inside it a couple of screws, or a few lima beans, or tiny stones, and a tiny bell. The next step to take is to decorate the box. We covered our sample with a piece of dark patterned wallpaper and then ran bright colored electrical tape around it. See the picture above. Do this or use colored construction paper and add the bright colored strips. Or just draw and color Indian designs on any white paper cover. The finishing touch is a couple of bright feathers. Make a hole in the center of the top end just large enough to fit a pencil into it. Now fasten some feathers to the end of the pencil with tape and slip the pencil in place. This little viewing box is easy to make and fun to play with. When you tire of your Native American Indian peep show, you can make any other kind of a peep show you like. Remove the cover from a shoe box and throw it away as you will only need the box part. Cut a small rectangle opening in one of the long sides of the box. This will be the "peep hole" through which you will look. Draw or paint a scenic background inside the box, on all sides except the one that has the peep hole. If you prefer, you may paste a background of magazine or Internet cutouts, instead. Your background may consist of sky, clouds, mountains, and trees. Cut brightly colored pictures of Indians and tepees that you find or draw. Paste them to drawing paper backings to make them stronger. Place the cut- outs into little ballsof self-hardening clay to make them stand, or glue them to small slices of cork. Arrange the cut-outs on the floor of the peep show, as in illustration A. Cut a piece of blue tissue paper a little larger than the top of the peep show. Place it over the peep show and fasten it with Scotch tape, as in illustration B. Look through the peep hole and enjoy your scene forever. You will need 1 old record (78) - get an okay from your parents before taking one of their old records, 1 stick or knife, enough plastic wood or putty to fill hole, enamel or finger nail polish, paint brush, can of hot water, and newspaper. Place record in hot water. When it begins to soften, remove with butter knife or stick. Place on newspaper and begin shaping. Work quickly as records dry fast. If bowl becomes too hard, dip in hot water. Fill hole with plastic wood or putty. Use enamel paint or nail polish to pain an Indian design and let dry. Materials needed are Finger of old leather or vinyl or plastic glove, piece of cardboard 2" x 5", marble or round bead, glue, enough cotton to fill finger of glove, black and white embroidery thread, 1 safety pin, red watercolor pencil, black paint, scissors, Scotch tape, and a ruler. Glue the marble or round bead onto a 1/2" x 2" piece of cardboard . Cut finger from glove and rip one side to 2" from end, then cut across 1 1/4". Round one end of a piece of cardboard 3/4" x 2 1/4" and insert into finger. Fold end and side of glove over cardboard and glue. Color the face tanish. Loop and tie several strands of black embroidery thread then paste to head for hair. Wrap cotton around cardboard to fill finger. Slip papoose in holder and tie with white thread. Tape safety pin to back. How about making your very own native american headdress (the typical indian chief hat that you see in pictures)? You will need a roll of paper to make this one. Measure out the paper to be about 25 cm(9.5") x 70 cm(27.5"). Fold it in two, so that the crease is on the left. Draw the design in illustration a. above, and then cut it out. Cut tiny snips into the feathers. Unfold your paper. In one band cut a slit half-way up, and in the other band a slit half-way down, as in illustratoin c. Link the bands together, as in illustration b. Now put it on—and you are an Indian Chief on Thanksgiving day! Draw Native American Indian Faces - Here are 2 native american indian faces ... just draw the face on each. How to Make a Native American / Indian Headdress Headband Costume from Corrugated Cardboard - This is a really cute idea to make a Native American Indian Headdress for a Costume or to just play dress up. This is easy enough for kids 8 years and older to make themselves. How to Make an Indian Costume - Learn how to make a native american indian costume. How to Make Native American / Indian Girl Moccasins Costume - This is a really cute idea to make a Native American Indian Girl Moccasins for a Costume or to just play dress up. This arts and crafts project is easy enough for kids to do, as long as they know how to sew as this project requires sewing pieces of felt together. This is a great arts and crafts project for girls and teens who want to make their own Halloween Costumes this year. How to Make a Native American Indian Village - Learn how to make a native american indian village with teepees / wigwams. Make Native American Indian Girl Foldable Papercraft - This printable indian girl is 3-dimensional after you fold it. Make Native American Paper Model Wigwams and Canoes - Use our free templates to print out, fold up and form indian / native american wigwams / teepees, and canoes. Have fun. Make These Paper Craft Foldable Native American Indians - Learn how to make these printable 3-d native americans. Make Totem Pole Mail & Notes Holder to Organize Your Desk- This is a really cute idea to make a totem pole to hold letters and special notes. Get all that loose paper off of your desk with this cool Totem Pole. Making a Totem Pole Room Decoration Craft - Do you have some brown paper bags from the store? Then you can make this cool totem pole. 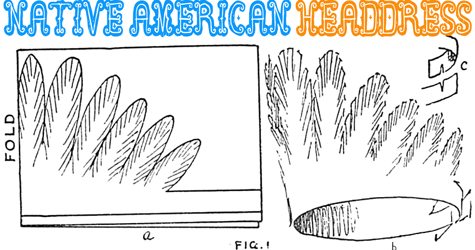 Making Indian Chief Heeadress of Feathers - Learn how to make an indian chief's headdress. Make Tepees from Cone Cups - Use water cooler cups to make these really cool native american tepees. Thanksgiving Paper Toy Model - This is a free printable first thanksgiving dinner toy model. This craft has pilgrims and indians as well as a feast and table. Model Ghost Town Craft - This Cardboard standup ghost town also comes with stand alone tepees and cabins. Milk Carton Totem Poles - Make these American Indian totem poles to celebrate Native American culture. Making Native American Headdress - Here is a headband full of feathers, just like native americans used to wear. Make an Indian Tepee Structure - How to make an indian teepee with paper, tape, and a stick. Canoe Dinner Placeholders - Remember that Native American Indians were at the first Thansgiving dinner...make canoe placeholders to remind you and your family of that. Arrowhead Neckerchief Slide - This arrowhead project is great for your scout or guide program. Make them into neckerchief slides or pins for SWAPing. Arrowhead Necklace : Thanksgiving Indians Crafts Ideas for Kids - Use actual stone arrowheads to make a Native American necklace. Backyard Tepee - Just like the traditional Native American tepee that inspired it, this backyard shelter can be assembled and dismantled in a jiffy. Bear Claw Compasses - Clip this compass to your back pack or your belt loop. This is one great Cub Scout craft. Birch Bark Canoe - Many Native American tribes made finely-crafted birch bark canoes. You can make a small model using construction paper and yarn. BirchBark Indian Canoes - Let's Go Paddling in a BirchBark Canoe! Bolos for Lenape Boys - Native American boys needed a keen eye and a steady hand to hunt food for their families. Learning to throw a bolo (two stones tied together) was how Lenape boys who lived along the Delaware River practiced these skills. What an accomplishment it was to twirl your bolo overhead, let it sail, and wrap around a bird’s legs! Imagine the thrill of capturing your first wild turkey! With your friends, make bolos similar to the ones that Lenape boys used. Buffalo-Hide Parfleche - Find historic and contemporary information about the cultures of one or more of the Native American Plains Indians including the Sioux, Crow, and Blackfoot. Learn about their homes, foods, everyday life, transportation, and tribal governance. They used parfleches, or rawhide envelopes and boxes, to carry their belongings while following bison (often called buffalo) herds. Canoe Photo Frame for Camp - Stitch up a canoe to hold your favorite camp photo. Canoe Place Card and Candy Holder - Set them out around the table to designate seating. Fill them with candy for a special treat. CD Dreamcatchers : American Indians Crafts Activities for Children - Find out how to make a unique dreamcatcher using old CDs. Clay Beads - Find out how you can make clay beads to use in jewelry making. Colorful Paper Masks - Masks are a way to make kinderart faces, that lift and transport us to new and wild places. From a bird to a beast to a sad happy clown, masks make you laugh, make you jump, make you frown. Using paper and scissors and objects you find. You can make masks of all colors and kinds. Cool Indian Pottery - Make a great Indian water pitcher! Dream Catcher - Dream Catchers are from Native American lore; they trap bad dreams and let the good dreams filter down to the sleeper. Dream Catcher - According to Native American legend, the Dream Catcher allows good dreams to pass through and slide down onto the sleeper. A bad dream becomes entangled in the web of the Dream Catcher. Easy Foamie Dream Catchers - Easier kit for kids as young as seven years old. Easy Indian Belts - An easy-to-make belt using a couple strips of fabric. Fringed Indian Arm Bands - A great addition to your Indian costume! Kachina Doll Craft - Kachina (pronounced kah-CHEE-nah) dolls are traditional, hand-carved wooden dolls made by Hopi Indians of the southwestern US. Each Kachina doll represents a spirit in life. Some typical spirits represented by the Hopi in Kachina dolls include: the chief, the corn maiden, the ceremonial dancer, the singer, the ogre, the buffalo, the badger, the crow, the hawk, clouds, the sun, and the rainbow. Kokopelli Necklace - The Hopi tribe of the Southwest is know for its finely carved "overlaid" silver jewelry. This flute playing Kokopelli is made out of shrink art to resemble this technique. The Kokopelli has been a sacred figure to Native Americans of the Southwestern United States for thousands of years. Indian Chief Headdress - Dress up for Thanksgiving with this fun Indian Chief headdress and Indian vest! A great way to teach kids about the origins of Thanksgiving. Indian Headdress Decoration - A cool craft made with beads and safety pins. Indian Leg Fringes - Make some decorative leg fringes! 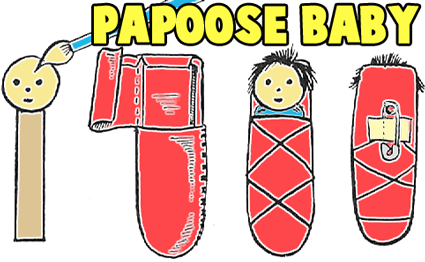 Indian Papoose Cradle - Make a Marvelous Indian cradle! Indian Peace Pipe - Create a fantastic Indian Peace Pipe from simple materials. A fun Native American craft that is a snap to make! Indian Vest - Make this fun and simple Indian vest from a brown paper bag. Lenape Indian Bandolier Bag : Pilgrims and Indians Arts and Crafts Projects - The Lenape or Delaware people were the Native American inhabitants of the land surrounding what is now called the Delaware River. They were among the very first Native Americans with whom the European settlers came into contact in the 1600s. Little Hiawatha - This is a little Indian boy, it's great for Thanksgiving. You can use it as part of a table centerpiece. Longhouse Spirits - Native Americans who live in Alaska, British Columbia, and Washington create art and drama based on characters in the traditional stories. The star of these is Raven, who is believed to be a trickster and also a shape changer (he could change his shape into other animals). Make Mine a Mola - Look at examples of colorful, detailed textile art created by the Cuna people. Many of their creations feature animals such as fish, lizards, or snakes. Outline an animal or any other shape for your project on bright paper with a Crayola Twistables® Colored Pencil. Fill your creature with lots of rounded interior shapes such as ovals and circles. Mexican Pottery - Look at samples and pictures of ancient and contemporary Mexican pottery. Describe the designs and shapes. What modeling techniques do you think were used to construct the pottery? How might these pots have been used? Mini Native American Headdress Pin - Our mini headdress is only 2" big. Just the right size for SWAPping! Mini Totems - Totem poles are tall, carved posts that were created by important men among certain tribes of British Columbia and Alaska. The carved and painted faces on a pole represented the animals or birds. The designs were carved to represent human and animal faces rather than to look exactly like them. 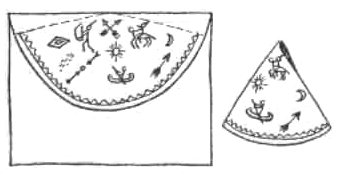 Mola Magic - A mola is a traditional blouse worn by Kuna women. The Kuna live on a chain of islands called San Blas Archipelago, on the Atlantic side of the Republic of Panama. These blouses are made of two panels that are hand stitched with intricate designs. Admiring travelers collect molas to wear or display in frames. Molas Exploding Color - Create a vibrant paper version of a traditional craft from the Cuna Indians, who live on islands in the Caribbean. Native American Bracelets - Decorate "leather" bracelets with Native American designs to make fashionable, wearable art. Great for both boys and girls. Native American Coiled Baskets - Make coiled baskets just like early Native Americans. Native American Dance Arm Band - Tie 'em on your arms; tie 'em on your ankles and start dancing. These dance bands will make you feel like a Native American. Native American Dance Fan - Native Americans made dance fans from natural materials to use in their ceremonies. Our dance fan resembles one made from birch bark by tribes in North America. Native American Dance Stick : American Indians Arts and Crafts Projects for Children - This craft project is highly recommended for ages 7 and up. Native American Doll Costume - Turn ordinary lunch bags into an extraordinary Native American outfit for your 18" doll. Native American Drum - Make a pretend drum using items you probably have around the house. Native American Drums for Kids - Make a Native American drum for kids to enjoy fantasy play. Most kids will eagerly work to make crafts that provide them with a toy in the end. A Native American drum can be crafted from common household items and fuel the imagination. Native American Foamie Headdress - All you need is tacky glue, our kit and a kid who likes to make stuff! Native American Headband - Make a Native American headband using a paper bag. Native American Headdresses - Native American Headdresses that you can wear and decorate! Native American Herb Pouch - Investigate the uses of herbs by Native Americans, create your own herb pouch, and collect local wild herb specimens. Native American Leg Rattle - Find out how you can make a neat leg rattle. Native American Medallion - Inspired by pendants carved by the Wampanoag, these medallions display symbols that hold special meaning for their wearers. Native American Medicine Pouch - Many woodland Indians, including the Cherokee and Iroquois, carried a medicine pouch. These bags were used to hold plants for medicine and also to hold personal items and good luck charms. Native American Moccasins - Make Native American Moccasins for your next Thanksgiving feast or pageant. Native American Noodle Beads - Instructions for making Native American beads out of noodles to use for jewelry. Native American Pendant - Children naturally tell stories with their art. This activity borrows from the rich cultural history of the Lenni Lenape to help children tell stories with Native American symbols and designs. Native American Picture Story - This project was inspired by Lenni Lenape story telling. Encourage children to tell their own stories through pictographs, or picture writing. Native American Rattle Craft - You can make a simple yet beautiful Native American rattle from a twig, yarn and beads. When you shake it, it makes a rattling sound. Many Native Americans made ceremonial rattles from natural objects (like deer hooves strung on twigs or rib bones). In this craft, we use beads, spools, washers, or shells as noise-makers. Native American Sand Art - Our Native American sand art project is based on the Navajo Sand Paintings used by medicine men for healing. Native American Sand Painting - You can purchase playground sand, collect sand from the beach or even use colored craft sand for this project. Native American Shields - Great shields to decorate with Native American designs. Native American Talking Stick - Make your own talking stick at Thanksgiving or when you are studying Native Americans - or when you need to restore some order to a family or classroom council! Native American Talking Stick : Thanksgiving Indians Crafts - The talking stick was used by Native Americans to show who had the right to speak. The chief would hold the talking stick and begin the discussion. We would pass the talking stick to the next speaker. Only the individual holding the stick could speak. Native American Tepees : Thanksgiving Indians Crafts - Create your own Native American tepee. Native American Vest : Thanksgiving Indians Crafts - Instructions for making a Native American vest out of a paper bag. Native American Wall Hanging : Thanksgiving Indians Crafts - Write your own message and lace it to the frame to keep on display. Native Pottery Replicas : Thanksgiving Indians Crafts - Pottery in any culture is an age-old practice that was originally practical and eventually became seen an art form. Ancient Native American pieces are beautifully decorated ceramics that are not only functional but a pleasure to look at as well. Choose a style of pottery from one Native nation to replicate. Navajo Sand Painting : Thanksgiving Indians Crafts - Navajo Indians made beautiful sand paintings inside their homes. Make some of your own! Pastel Parfleche Pouch : Thanksgiving Indians Crafts - Find out how Native Americans used natural resources to create items for their everyday use, such as cooking utensils, clothing, and storage containers. To make a portfolio for your art or writings, design a parfleche that looks similar to the bark or leather used by Native Americans. Pinch Pots : Thanksgiving Indians Crafts - Kids really enjoy working with clay. We have a self-hardening red clay that gives a kiln-fired appearance. Pocket Dream Catcher : Thanksgiving Indians Crafts - Bring with you anywhere you go this pocket dream catcher craft. Prepare for a Powwow : Thanksgiving Indians Crafts - You’ll hear the drums and smell the food first! At any Native American powwow, be prepared for the dancers’ stunning colors and a friendly welcome. Printable Native American Headdress - This printable Native American Headdress comes just in time for the Thanksgiving pageant. Pueblo Pottery : Thanksgiving Indians Crafts - Native Pueblo women and men from the southwestern United States are famous for their handmade pottery. They often dig the clay and build their pots with clay coils, rather than forming them on a potter’s wheel. Pueblo pottery reflects many different regions and native nations. Rainbow in a Rug : Thanksgiving Indians Crafts - Navajo (Dine) weavers are highly skilled artisans. They have been weaving wool for about 150 years. Weaving a 3- by 5-foot (.9 m x 1.5 m) rug can take up to 350 hours after the wool yarn is prepared. It takes even longer if plant dyes are used to dye the wool. Rainmaker Craft : Thanksgiving Indians Crafts - A Native American medicine man might shake something similar to this when calling for rain! Older children can use this craft as an opportunity to look at Native American design - while younger children will enjoy making a fun musical instrument! Rainstick : Thanksgiving Indians Crafts - Rainsticks are ceremonial musical instruments used to invoke the rain spirits. They are made by people who live in the deserts of northern Chile. In Chile, rainsticks are traditionally made from dead cactus tubes with hundreds of cactus spines hammered into the tube. Tiny lava pebbles cascade gently through the tube, sounding much like rain. Reeds and Rainwater Make Basket - Weave a basket? Sure! Explore how the Caribs of Dominica use natural materials to create beautiful handcrafted baskets. Sand Painting : Thanksgiving Indians Crafts - Sand paintings were made as a way of chasing away evil spirits. Make your own! Team Totems - Totem poles are traditional among Native American clans who live along the Northwest Pacific Coast of what is now the United States and Canada. Research how their totem poles are carved. Find out about some of the traditional images used, such as ravens, beavers, whales, and thunderbirds. Many symbols signify characteristics of which families are proud. Tepee - Many Native American tribes made tepees (tepee is sometimes spelled tipi or teepee) from long tree limbs and animal hides. You can make a wonderful model tepee using a brown paper grocery bag and twigs. This is a simple, inexpensive craft and one that looks quite good! Tepee Treats - Historically, an Indian tepee was made from a cone of long poles and a hide covering that appeared shiny white until the hearth fire cured it. Construct a village of similarly handsome - though edible - tepees with this food craft. Terrific Tomahawks - Make a simple cardboard Indian tomahawk. The Buffalo - Native people living on the Great Plains depended on buffalo for survival. Discover many uses for their hides - and other parts! Tippy Canoes - Small paper canoes with tiny paddles. Toilet Paper Roll Indian Hat Craft - You won't believe how easy it is to make this fun Thanksgiving place card holder that looks like an Indian headband. Totem Pole - September 25th is Native American Day. Here is a chance to recycle those tin cans into this fun totem pole and teach young people about our Native American heritage. Totem Pole - Totem poles are made by the Tlingit Indians of the Pacific Northwest coast of North America. Traditionally, each Totem Pole tells the story of a Native American family's ancestral spirits and family history (pictured in human and animal form). They depict the spirits as people, mythical beasts, and wildlife treasured by the Tlingit Tribe. Totem Pole Craft - Make this craft using toilet tissue rolls. Totem Pole Group Project - Make a fabulous Native American Totem Pole as a group. Totem Poles - Terrific Totem Poles that you can build as high and elaborate or as simple as you want. Totem to Tell a Story - Totem poles traditionally are tall wood carvings of animal heads and/or bodies. They are used to tell stories or legends, as Native Peoples have for centuries. Only a few northwest Native Americans create these beautiful wood carvings, including the Canadian Haidas. Learn about Haida customs, their skill in carving beautiful and intricate totem poles, and how the wonders of nature inspire them to carve these designs. Toy Canoe - Like the birch bark canoes built centuries ago by the Indian tribes in New England, this lightweight toy craft cuts quickly and smoothly through water. Tribal Shield - What do you think about when you study North American Plains Indians? Is it bows and arrows? Shields were just as important to these Native Americans. Find pictures of these artifacts. Some shields were made from rawhide. This buckskin might have come from antelopes. They were more abundant than bison on the Plains at one time. YuckyTotem Poles - Use cardboard boxes and these printable facial features.